Unlike conventional airbag deployment systems, Hyundai's latest airbag system provides additional safety in multi-collision accidents. Hyundai Motor Group (HMG) aims at revolutionising vehicle safety through its latest development - the world's first multi-collision airbag system which will provide additional protection in case of secondary impacts. Multi-collision accidents involve a scenario where the primary impact is followed by collisions with secondary objects, such as trees, electrical posts or other other stationary/moving vehicle. Current airbags setups are not calibrated to deploy when the initial impact is insufficient. However, a multi-collision airbag system allows airbags to deploy effectively upon a secondary impact by calibrating the status of the vehicle and the occupants. The system developed by Hyundai detects occupant position in the cabin following an initial collision. When occupants are forced into unusual positions, the effectiveness of the conventional deployment setup may be compromised. However, as per Hyundai, a multi-collision airbag system is designed to deploy even faster in case the above scenario holds true, providing additional safety when drivers and passengers are most vulnerable. By recalibrating the collision intensity required for deployment, the airbag system responds more promptly during the secondary impact. 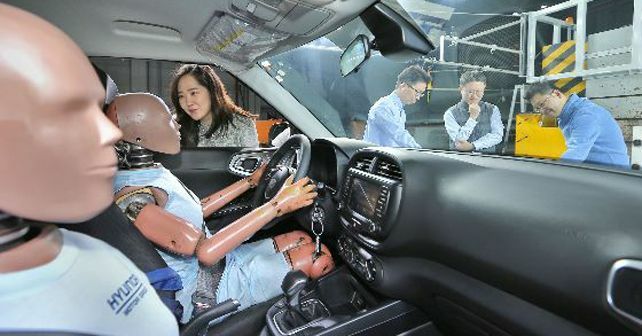 'By improving airbag performance in multi-collision scenarios, we expect to significantly improve the safety of our drivers and passengers,' said Taesoo Chi, Head of the Chassis Technology Centre at Hyundai Motor Group. 'We will continue our research on more diverse crash situations as part of our commitment to producing even safer vehicles that protect occupants and prevent injuries,' he added. Based on the statistics revealed by the National Automotive Sampling System Crashworthiness Data System (NASS-CDS), a branch of the National Highway Traffic Safety Administration (NHTSA) in the United States, nearly 30% of the total accidents (56,000) in the North American region during the 2000-2012 period were involved in a multi-collision scenario. While such statistics are difficult to source in countries like India, it is quite plausible that the statistics would more or less be the same for many other countries across the globe, thereby creating the demand for such safety systems on a global scale. While Hyundai is still developing the system for future commercialisation, we are yet to receive a final timeline of when this system will make its production debut in the future Hyundai and Kia models.